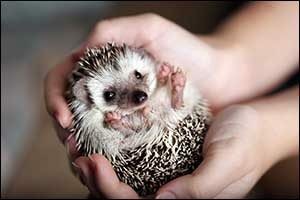 While the popularity of small rodents as pets has grown across the United States, it can still be difficult for Southeastern Massachusetts pet owners to find a clinic that will provide vet care for what are known as pocket pets. While not all of these animals would comfortably fit in a “pocket,” they still fall under the category of small animals. Anchor Animal Hospital in Dartmouth provides a wide variety of services, including vet care for small rodents. The small mammals that we treat by appointment include rabbits, Guinea pigs, ferrets, hamsters, rats, gerbils, hedgehogs, and much more. The reason why we are able to care for small mammals and small rodents as pets is that we have several doctors on staff who have dedicated themselves to advancing their knowledge and skills with these tiny patients. We even have specialized equipment that is designed to assist with the unique needs of our exotic pet patients for Southeastern Massachusetts pet owners. When you bring your small mammal to our clinic, you will see that we have the appropriate housing for care, as well as proper feeding supplies, anesthetic equipment, specialized medications, and our doctors are even experienced at drawing blood for all types of vet care for small rodents. While we are proud to offer vet care for small rodents and mammals in addition to treatments, appointments, surgery, pain management, and other services for cats and dogs, there are some types of pets that we cannot treat. The exotic pet community is quite vast, and there are some animals that for safety and legal reasons cannot be seen at Anchor Animal Hospital in Dartmouth. Those animals include primates, wildlife, venomous snakes, monitor lizards, waterfowl, birds of prey, and invertebrates. Our website offers a complete FAQ listing of licensed rehab facilities for wildlife care, should you require these services. When it comes to the care of small mammals or small rodents as pets, the most essential advice you can receive is regarding nutrition and habitat. The needs of these animals can be so specific, and if you aren’t providing them with the food, housing, temperature, moisture, and other requirements that they need to survive, they can quickly become very sick. Our team of veterinary specialists believes strongly that many medical disorders experienced by popular exotic pets are directly related to diet. We will work with you to develop an appropriate diet for your pet, including supplements and treatments that can help them recover if they are ill.
Vet care for small rodents, mammals, and other exotics can help your pet to live a long and healthy life. We can discuss your pet’s unique nutritional requirements to find a solution that will provide the best solutions. We carry a full line of Oxbow Products, including papaya tablets, vitamin C supplements, hay, and grain for Guinea pigs and rabbits. We also carry Oxbow Critical Care products for carnivores and herbivores, which are appropriate to use with small rodents as pets. Our doctors will also take the time to work with you to make sure that you are providing the proper housing for your pet. Sometimes just a slight change in habitat can make all the difference. At Anchor Animal Hospital in Dartmouth, we love our pets just like you do. Our team of highly trained and experienced veterinary professionals share your goal of ensuring that your pet receives the best quality care and treatment. We can take new pets at our clinic regardless of their stage of life or state of health. We are excited to have new patients become a part of our Anchor Animal Family and enjoy establishing a long-lasting relationship with our patients and Southeastern Massachusetts pet owners. So whether you require vet care for small rodents, cats, dogs, or exotics, contact our team to schedule an appointment to get started. Visit our website to fill out our New Client Form, which will help you to spend more time with your pet at our office instead of having to fill out information on a chart. We also have a guide that will help you to be prepared titled, “What to Bring With You” that will make things even easier on you and your pet. Read up on our Payment Options so you will know what to expect and have an idea of the options available to you at our animal hospital in Dartmouth. If you have any questions about our services or would like to schedule a first-time appointment, give us a call at 508-996-3731.